I would say that in our house, mommy is the primary book reader. Bookworm1 seems to instinctively know that I will always say yes if asked to read a book. (The chances of my saying "no", no matter what I'm doing, are practically slim to none. I'll pretty much drop anything for a book.) However, there are certain books that I am NOT allowed to read aloud to him and I cannot figure out why this is so. These are special Daddy Only books. Daddy reads them better, I suppose. Since these books are classics, they hardly need an introduction. 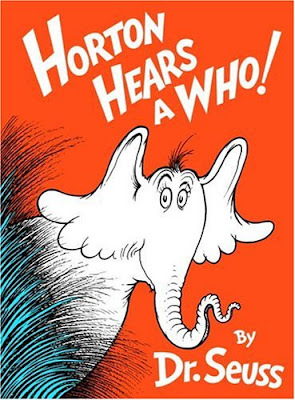 Ever since we watched the movie, Bookworm1 has been a fan of Horton. Daddy has read this book to him numerous times. Mommy? Less than once. DADDY HAD NEVER EVEN READ THIS BOOK BEFORE! He read it for the first time with his son. How wild is that?! At any rate, the boy sat through the whole thing. With Mommy? No interest whatsoever. When Daddy reads this book, Bookworm1 giggles and laughs. When Mommy reads it, he sits there stoically until apparently he cannot bear it anymore and then he just gets up and walks away. Nothin' doing. Mommy doesn't read it right. Since I'm home all day and we read books together all the time, I don't really mind so much. I just don't get it. Jonathan says he hardly read any Seuss books in his home growing up (which I find strangely unbelievable but then everyone has their quirks) and many of these books are new to him. Yet I, who was a relatively devout Seuss fan, cannot share the joys with my own child! (Please do read all the sarcasm here.) It's a strange world and very unfair at times. I suppose as long as the little guy is enjoying them at all I ought to be happy, right? Totally unrelated note: I just heard my 4 year old say "Let's have school" to his 6 yr old brother. They are now sitting together and the 6 yr old is reading to them. :) I LOVE it!! So funny... There are certain stories from my childhood I STILL hear in my father's or my mother's voice. My dad did a killer reading of 'Rabbit and Skunk and the Scary Rock.' My mom read the Little House books. For some reason, I didn't have much Dr Seuss in my childhood either. Not sure why. Kids are funny, aren't they? Who knows? Dr. Seuss really tangles my tongue, but I persevere. 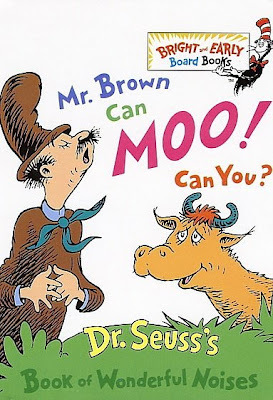 My girls have always like Mr. Brown a lot. So glad you played, as always! How funny! I've never heard of a child having a preference like that. I guess daddy needs his day to shine too. My girls loved Dr. Seuss books. maybe something about your mooing isn't quite right. I offer lessons in all things cow if you need assistance . . Interesting. I wonder why? Those sounds that Mr. Brown can do are tough.